Looking for more discussion on lifestyle simplification, plus tips on living frugally, without suffering? 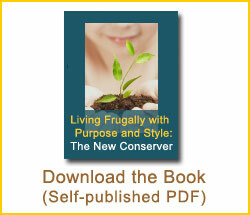 The self-published book by Dolores Hark entitled, “Living Frugally with Purpose and Style: the New Conserver,” is now available for download. Dolores basically wrote this book for herself after her struggles to manage escalating credit card debt, not once but twice. Additionally, the book is in keeping with her own views on the environment and trying to live an environmentally-friendly, sustainable lifestyle. Dolores has a Master’s Degree in Economics and in Sociology from a renowned U.S. based university. She provides a serious look at how to better manage Household Economics.